I've always wanted to ask a football player: how much do you love your club? If you see your club go down, what are you willing to put on the line to see them go back up? The notion that "players will come and players will go, but the fans are the club" is one that is sadly true in what has become a money-filled sport. The story of a player sacrificing money and success for his club? That story is rare. That story is beautiful. This is that story. This is the story of a player who loved his club. It'll be a long time if and when someone beats his record. Francisco Pérez Pérez, also known as Chico, currently holds the record for being the oldest player to play in the Segunda B - 43 years and 93 days is the figure. That's a figure that second place Diego Rodríguez Fernández (41 years and 324 days) falls short of by a year and 134 days. I should also point out that the top 3 list for oldest players to play in any of the top three tiers is Harry Lowe (48 years 226 days), Juan Urquizu (46 years 208 days) and Francisco Pérez Pérez - each player being the record holder for the first, second and third tier respectively. But Harry Lowe got his La Liga record in 1935 by making one 90 minute appearance for Real Sociedad while he was the manager - five years after retiring as a player. Juan Urquizu got his Segunda record in 1948 by making one 90 minute appearance for Barakaldo which he was the manager - 13 years after retiring as a player. Francisco Pérez Pérez got his Segunda B record on 22th August, 2015. And then again on 29th August, 2015. And yet again on 6th September, 2015. And then again 14 times over (17, if you count the playoffs and Copa del Rey). And he obtained his record at Linares Deportivo, whilst still being a player all that time - yes, no managerial stints in between. Given that Harry and Juan obtained their records at a time when player registration rules were completely different, who was the oldest player, in the true sense of the word, to play in any of Spain's top three tiers? No, not Harry Lowe. No, not even Juan Urquizu. It's Francisco Pérez Pérez. He was born, in a family of five brothers, in Lupión, a small municipality in Jaén. And so to be given his professional debut at 27, with Real Jaén, was a dream in itself. But his story before, and the story after, is what makes "Chico" Pérez's story fascinating. Starting out at Zaragoza B, in the 1994-95 Segunda B, at the age of 21, he would quickly find that his road was a long and arduous one. The Aragonese side's relegation meant that Chico returned to his home province, signing for teams in localities right next to Lupión - he played for one season at Baeza, and for three seasons with CD Linares. Those four seasons were spent in the Tercera, and at the age of 26 the center-back's career was destined to be spent in amateur football. 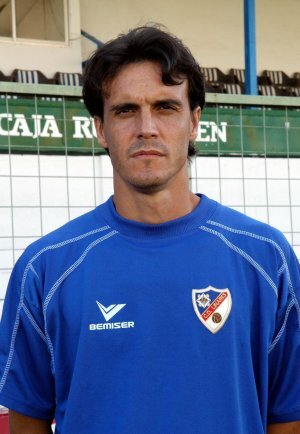 But Real Jaén had noticed his performances, and the Segunda B side signed him - and he thrived, being an undisputed starter in a 1999-00 season that ended in promotion. And at the age of 27, he was a professional footballer. That was the story before - the remarkable rise of a player. But the story after is the story of love. Not just a love of a club but also a love of football. After spending two seasons in the Segunda (ending in relegation), joining Algeciras in the Segunda B, helping them get promoted at the first time of asking and playing a third season in the Segunda at the age of 30 (which also ended in relegation), Chico returned to a club that had given him the opportunity to be in the Segunda. CD Linares were blessed to have the center-back for five more Segunda B seasons, from 2004-09, before tragedy struck. The club was in 4.7 million euros of debt, and an administrative relegation followed. However, the RFEF subsequently forced the club to disappear, and Chico Pérez's love for the club had ended not by choice but by force - with the club's extinction. It was over. Or was it? From the "Gran Capitán" to the "eterno capitán". In the 2009-10 season, Francisco Pérez played for two teams - Lucena in the Segunda B and Atlético Mancha Real in the Tercera. But at the same time, a new club, Linares Deportivo, replacing CD Linares, had been formed and was making waves in the seventh tier of Spanish football. And after Linares Deportivo came first in their group and were promoted to the sixth tier, Chico Pérez went from playing in the third tier to playing in the sixth within just a few months. He returned to the Linarejos, where it all started, making it his mission to see Linares Deportivo succeed. Hundreds of fans joined in too - at the end of the 2010-11 season Linares came first and were promoted to the fifth tier. At the end of the 2011-12 season Linares came second after Villacarrillo, but the league was marked by 800 fans traveling to Villacarrillo's stadium. Linares had to play a playoff against AD Huercal, and drew 2-2 at home, but won away in a famous 4-0 victory that saw the team promoted to the Tercera. At the end of the 2012-13 season Linares came in 5th, just a point away from playing in the promotion playoffs to the Segunda B. At the end of the 2013-14 season Linares came 2nd, and defeated Terrassa and Rayo Vallecano B but controversially lost to Socuéllamos - a last minute goal which would have given Linares the tie due to away goals was incorrectly ruled out. And at the end of the 2014-15 season Linares came in first place, meaning that they only had to play Castellón to go up - and they did. All the way, Chico was there - from the initial sixth tier days to the celebrations in Castellón's stadium. He was there for five of the six years it took for Linares Deportivo to reach the league that CD Linares had to abandon. He was there for another season too, playing 17 league games in the 2015-16 season which ended with Linares coming 16th in the league - surviving via a second half comeback in the second leg of a relegation playoff against Cacereño. Married and a father of two children, he has always cared for his physique. He is the first person to reach the training ground and the last to leave. He has lasted so long simply because he has not suffered a major injury - except for a couple of minor muscular injuries, his body has endured for many many years, for what feels like an eternity. 22 years, actually. And 22 years after he had traveled to Aragon to make his Segunda B debut, Francisco Pérez had helped the club 20 km from his home - and made a Segunda B record. And the story of the "eterno capitán" has not ended yet. He immediately became the coach of Linares' B team for the 2016-17 season, and this season is the second coach of the first team. He is Linares through and through. Let's celebrate that rare and beautiful story.